Linguatec has brought a new generation of text to speech software to market with its new speech output program Voice Reader 15. Based on state-of-the-art TTS technology and controlled by linguistic pre-processors, text is converted to stunningly natural and pleasant speech sounds. With just a simple touch of a button, Voice Reader converts any kind of text into astonishingly good quality audio files. Available in four versions: Voice Reader Home 15: TTS for private users, Voice Reader Studio 15: TTS for professional users, Voice Reader Web: TTS for the automatic dubbing of websites and Voice Reader Server 15: TTS for use in companies. In more than 45 languages! The speech recognition solution Voice Pro Enterprise 4.0 has been developed especially for companies, which want to stay productive in the age of cloud computing and mobile applications. Voice Pro Enterprise 4.0 is speaker-independent, delivers a high level of recognition accuracy, is suitable for use on desktop or mobile device and guarantees high data security. Voice Pro Enterprise 4.0 supports German and English. For the desktop arena the speech recognition technology of Voice Pro 12 (only available in German) was developed. Along with Voice Pro 12 Standard for private use and Voice Pro 12 Premium for professional use, there are also comprehensive specialist solutions: Voice Pro 12 Legal for lawyers and Voice Pro 12 Medical for doctors. The program Personal Translator 20 uses SmartTranslation™ technology, which increases the translation quality with intelligent processes, and at the same time makes it even easier to use. 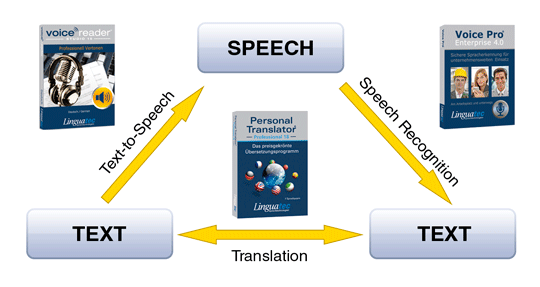 The Personal Translator portfolio includes 7 language pairs for single users and networks. The renowned Fraunhofer Institute certifies that Personal Translator results in a time saving of over 40% compared to the conventional process of translation. 88 of the top 100 companies in Germany and 61 of the top 100 European companies are already using Linguatec’s Personal Translator.